- At the exhibition we are representing the independent Azad Azerbaijan Tele-Radio Company, and in particular one of its projects - ATV plus, which is a wireless television broadcasting operator that began operating in late 2013. Therefore, this is our first time at this exhibition. Our product has a number of convenient advantages, one of which is its wireless nature. For ATV plus subscribers there is no need to suffer the installation of cable lines at home. We provide good quality digital broadcasts. At the moment we offer customers a standard package of channels, which includes 96 local and international channels. Just before New Year, we are planning to launch a new package, which will include 156 channels. To receive our broadcasts, customers only need to install a receiver or a CI with a smart card. 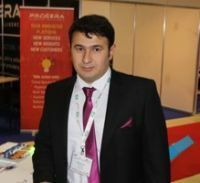 Traditionally a lot of local and foreign companies are involved in Bakutel. Overall, we think that the event is well organized and hope that this will result in a positive outcome for our company.